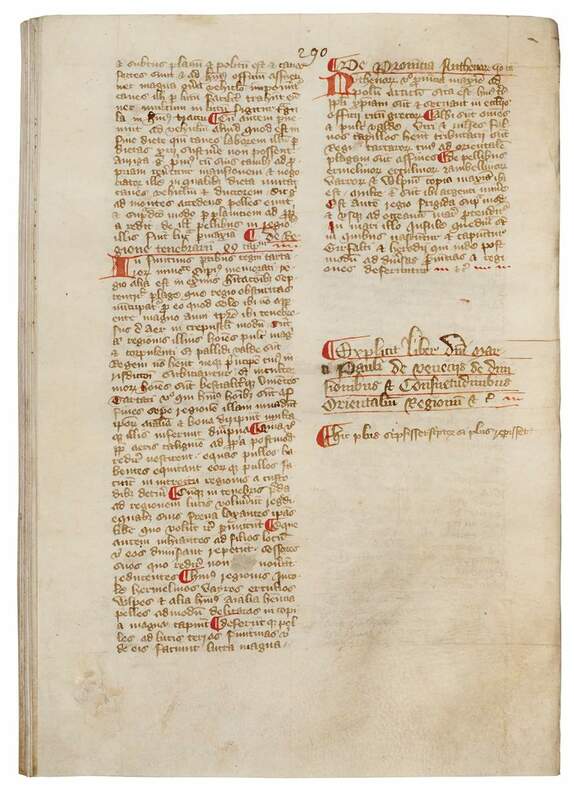 This is evidently the long-lost manuscript of historical tracts used by the scribe of the Burghley transcripts, last seen in the 16th century, and containing the only substantial Marco Polo manuscript to come to the market in nearly a century, as well as the only medieval manuscript of the "Encomium Emmae" (a contemporary biography of the wife of King Cnut) in the version revised for her son Edward the Confessor, and a number of other important and rare historical texts including accounts and assessments of medieval Islam and the Near-East. 272 x 190 mm. – 219 leaves. The manuscript was probably produced by a member of the Augustinian canons of the priory of Breamore in Hampshire from manuscripts in the library of Glastonbury Abbey. The manuscript contains a compendium of historical accounts, most probably assembled by a single monk in order to furnish his house with a volume containing a comprehensive outline of all history he thought important. It is split into three distinct parts, each marked off from each other by blank leaves: the first concerns British history, the second Near- and Far-Eastern affairs, and to this has been appended a collection of prophecies. The most important texts in the section on British history are the Encomium Emmae Reginae, an anonymous laudatory biography of Emma, the wife of the Danish invader King Cnut (1016-35), and Gildas’ De Excidio et Con questu Britanniae (On the Ruin and Conquest of Britain). The section on Near- and Far-Eastern history opens with the epic travel account of Marco Polo (d. 1324-25), the most famous and popular of all medieval Western travellers to the East. The manuscript contains all three books of his wide travels, in the Latin translation of Francesco Pipino (translated in the last years of Polo’s life, from Polo’s own Italian version of his work, now lost). This work is now in the collection of the Royal Library in Copenhagen. It has been digitized here.